1. Seeing all of my beloved family and friends. My friends here are wonderful,but there is nothing like the people that know you so well, have cheered you on so much and who cannot wait to see you too!! 2. Summertime in Michigan. Summertime in Africa right now is ok, it is sunny and hot most of the time. But I am limited in what I can do here. In order to enjoy the weather you either go for a walk on the dock, or sit outside on the dock and stare out at the ocean. I cannot wait to go fishing with my dad and take walks to the ice cream stand with my small group girls. Seeing green grass instead of red dirt and mud sounds nice too. 3. Freedom to move about the earth on your own. 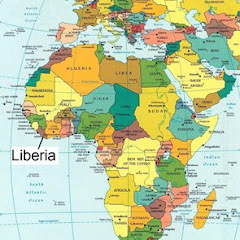 Here in Liberia for our own safety we are not allowed to go off the ship alone, you must be with at least one person. Also, going into town is such an experience - I cannot do it justice by writing about it. So, I am looking forward to getting in my car and driving to wherever - the grocery store, the bank, Target. Of course I know gas prices are out of control. In case you are wondering, the same is going on here. Just this past week almost all of the taxis went on strike for a day due to gas prices. It made it harder than ever to get a taxi. Already taxis here are filled way over capacity with people sitting on laps, etc. I didn't think that there could be more people walking on the streets than there already were - but the streets were filled with people forced to walk to their destination instead of get a taxi. The strike was over in 1 day. 4. Eating whatever I want, whenever I want. The food here on the ship is good, I definitely have no complaints about that. But in a cafeteria type set up if you don't eat when the food is out, you don't eat. So, even when you aren't all that hungry you go to the cafeteria to at least see what is being offered. I am also looking forward to all of the good fruits and vegetables that Michigan summer has to offer. Here we are very limited to what is available. Every day for lunch and dinner we eat pineapple, cucumbers and tomatoes. Every day. 5. Sleeping in my own bed, in a room that I have all to myself. Currently I share a small cabin with 4 other girls. My new bunk-mate will arrive tomorrow. So, I go back to sharing a very small space with one other girl. 6. Change of clothing. I have to say I think I did pretty well in packing good and appropriate clothing for this trip. I am however, tired of the clothes I brought. I am looking forward to a change in scenery of my wardrobe...and some different flip-flops. 7. A long hot shower. Here due to water supplies we are limited to 2 minute showers. The usual routine is turn shower on to get wet, turn shower off and soap up, turn shower on to rinse. Turn shower off and step out. It isn't that big of a sacrifice, but I have forgotten what a nice long shower feels like. 8. Silence. Living on a ship of over 400 people there isn't much in the way of solitude. Even when it is bedtime and most of the crew are sleeping there is always some sort of generator running somewhere. I don't know much about large ships, but it seems there are always strange noises coming from the walls. 9. Windows. I currently don't have a window of my own. My cabin is on deck 3 which is a window-less deck. I also happen to work at the hospital on board the ship, which is also on Deck #3. I could go all day and all night and never look outside. I have to admit, sometimes I haven't seen day or night at all. It will be so nice to sit in my living room, holding Johnny Cash (my cat) and looking outside. 10. Diet Coke. Not that I am addicted to the stuff or anything, however I am sad to report that the ship ran out of their supply of Diet Coke about a month ago. JG~What a mixed bag life is! The agony of leaving and the ecstacy of coming HOME!!! Lot of emotions there to explore...be sure to do that my sweet friend. It's all good. my comedy is you are coming home...my tragedy is...you are ruined for america, iam certain of it!! i'll have a diet coke waiting for you. I am looking forward to going fishing with you too. Just the other day, I caught a fish that was looking for you and was not at all happy that I caught him. He said he would rather be caught by someone he was sure would not keep him, and that I cannot be trusted in that regard. Jenny~ I've been getting caught up on your blog, and can I just say I'm very impressed, inspired, & humbled by your actions. Thank you for being so open to God's calling for your life. I can't wait to see you, and hear your stories first hand. I had to laugh about the "sick of your clothes" comment. I felt the same way on a 5 week mission trip to Argentina. I remember that feeling of never wanting to wear any of those clothes again.